The third annual Living Labs in Southern Africa (LLiSA) was hosted by the Siyakhula Living Lab at Rhodes last week. The workshop, which was sponsored by SAFIPA as part of its work to promote a knowledge society in Southern Africa, attracted delegates from around the country including North-West University, University of Zululand, Nelson Mandela Metropolitan University, University of Fort Hare, Meraka LimDev (Limpopo Living Lab), RLabs (Reconstructed Labs, Cape Town), East London Industrial Development Zone and SAP Research. A “Living Lab” represents a novel approach to innovation, technological and otherwise, by developing solutions and interventions in collaboration with the actual community for which they are intended. Professor Alfredo Terzoli, head of the Telkom Centre of Excellence at Rhodes University, said the labs offer great potential for the synergistic combination of teaching, research and community engagement in spear-heading technical innovation and social transformation. “Living Labs aim to build infrastructure, physical, mental and technical, to enable communities to come up with new processes, ideas and products that will make life in those communities better,” Prof Terzoli said. After success in Europe, Living Labs have been started in South Africa by COFISA, a programme that forms part of a bilateral agreement between Finland and South Africa. All the major South African labs were represented at the workshop. 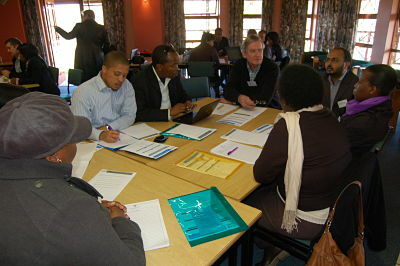 Under the theme, “Making Living Labs relevant in Southern Africa”, the workshop focused on discussions about what makes current Living Labs relevant to their participating stakeholders. The “classic Living Lab partnership”, or quadruple helix as described by Prof Terzoli, includes academia, local communities, government and industry. Delegates were encouraged to mastermind proposals concerning the attractiveness of Living Labs to the various stakeholders, and these ideas are now being formulated into “pitches” to help the sustainability of the labs across the country. During the workshop Paul Cunningham, CEO of International Information Management Corporation, presented a draft paper on plans to expand the Living Labs across Africa, to include East, West, Central and Northern Africa respectively. “This is something the African Union and the European Union are very interested in and it is going to be submitted to a joint commission in September,” said Prof Terzoli. “LLiSA is the example that is going to be promoted, even though it is still in its initial stages,” he said. The Siyakhula Living Lab was started in 2008 and is a joint venture between the Universities of Rhodes and Fort Hare in the area of ICT for Development (ICT4D) and is a founding member of LLiSA. Prof Terzoli described the workshop as a success and said it was well attended and represented the current community of Living Labs practitioners in South Africa.